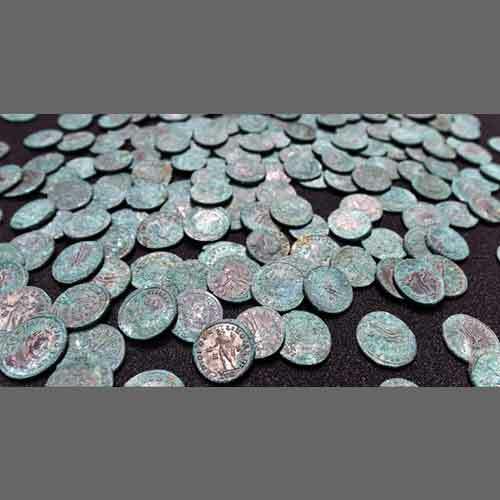 When the time is right, things will appear and that’s what happened at an Abbey in France when a hoard of medieval coins and treasure were found. The find includes 2,200 silver deniers and oboles, a medieval coin then worth a half a denier. The treasure was unearthed during a dig in September at the Abbey of Cluny, in the French department of Saône-et-Loire.The former Benedictine monastery was dedicated to St. Peter. A total of 21 Islamic gold dinars, a signet ring, and other objects made of gold were also part of the hoard. The officials, who discovered the hoard, are astonished as never before such a large cache of silver deniers have been discovered, nor have gold coins from Arab lands, silver deniers, and a signet ring ever been found together within a single, enclosed complex. The find was disclosed in early November. Anne Baud, an academic at the Université Lumière Lyon 2, and Anne Flammin, an engineer with the French National Center for Scientific Research, both represent the Laboratoire Archéologie et Archéométrie at Claude Bernard Lyon 1 University. Together, they began the archaeological investigation, in collaboration with a team of nine students from the Université Lumière Lyon 2 and researchers from the Maison de l’Orient et de la Méditerranée Jean Pouilloux. Since 2015, Students in the Master of Archaeology and Archaeological Science program at the Université Lumière Lyon 2 have been participating in archaeological digs at the Abbey of Cluny. Through this, the students are trained and given an insight into professional archaeology. Most of the coins in the hoard were minted at the Abbey of Cluny or nearby areas by the first half of the 12th century. The silver coins were concealed in a cloth bag, traces of which remain on some of the coins. Among the silver coins, a tanned hide bundle was found, fastened with a knot, enclosed with the 21 Islamic gold dinars. They were struck between 1121 and 1131 in Spain and Morocco, under the reign of Ali ibn Yusuf (1106 to 1143).Yusuf was a member of the Berber Almoravid dynasty. Also, included among the Islamic coins was a gold signet ring with a red intaglio, depicting the bust of a God and an inscription possibly dating the ring back to the first half of the 12th century. A signet ring was a very expensive piece of jewelry that few could own during the Middle Ages. Other artifacts in the small bundle are a folded sheet of gold foil weighing 24 grams and stored in a case with a small circular object made of gold. Vincent Borrel, a doctorate student in the Archaeology and Philology of East and West research unit, is presently examining the treasure in more detail to identify and date the various pieces with greater precision. This discovery will breathe new life into research delving into the past of the abbey, a historic site open to the public and managed by the Centre des Monuments Nationaux.